The evergreen leaves in the background are Pileostegia viburnoides. nice title and comment very appealing plant :-) a beautiful bride. I do love this plant, yours looks stunning, it hates our garden......have moved it to different positions, fails every time? Why do you think your Exochordas fail ? Mine is by a fence... quite a protected corner. Never put it by a fence, usually in open ground, could that be the problem? Yes... I planted mine by a fence because I had no choice... and it really seems to like that sheltered environment. Gorgeous Terra. Do you prune it? This was my Mum's favourite shrub, so I have one but it is looking a bit haywire! thank you ... I haven't pruned my Exochorda yet because over the years it has been quite slow-growing ... but some of the branches are now becoming rather long .. I love this shrub,Terra..such a lovely pure white..I didn't know it was a slow grower..does it need any particular type of soil please ? 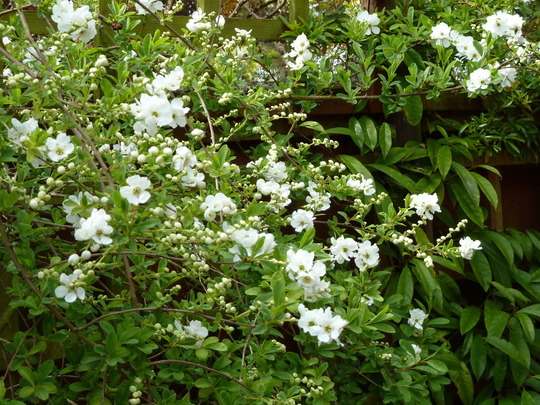 Exochorda has been quite slow growing in my garden, but it is situated in a rather dry area. RHS site says any soil is okay. As you can see above, Dotty sadly hasn't had success with these, but mine is planted by a fence, so is sheltered... that seems to help. A very pretty shrub indeed and any hint of springtime is fine with me!! I'm guessing you like this variety ? Yes .. my Exochorda is sprouting well at the ends of the branches. I usually remove the 'seeds' but it doesn't seem to make any difference to the health of the shrub.